BTFD was the rallying cry of crypto traders throughout 2017. The beginning of 2018 will test even the most stalwart HODLers. When is the right time to back up the truck? It surely wasn’t at $15,000, $10,000, or $8,000. Trading both ways is intellectually challenging. The gains one made by faithfully adhering to one very profitable strategy can evaporate in days. Things change, and so should your trading strategy and mindset if you are actively punting crypto. Because the financial media always needs a reason why crypto gyrates the way it does, they descend upon their trusted sources and hound them for any explanation at all. I will go through some of the reasons routinely put forward. The day the CME Bitcoin futures contract launched marked the top of this bull run. The BitMEX Bitcoin Index (.BXBT) flirted with $20,000 on that fateful morning. The following two months proved that it was an amazing top at which to short Bitcoin. Now that large financial institutions could short Bitcoin by only posting USD, the thinking was/is that they will use their financial might to short Bitcoin into the ground. The first thing most financial reporters fail to understand is that on a futures exchange, there is a long for every short. By definition, a futures exchange has no net impact. 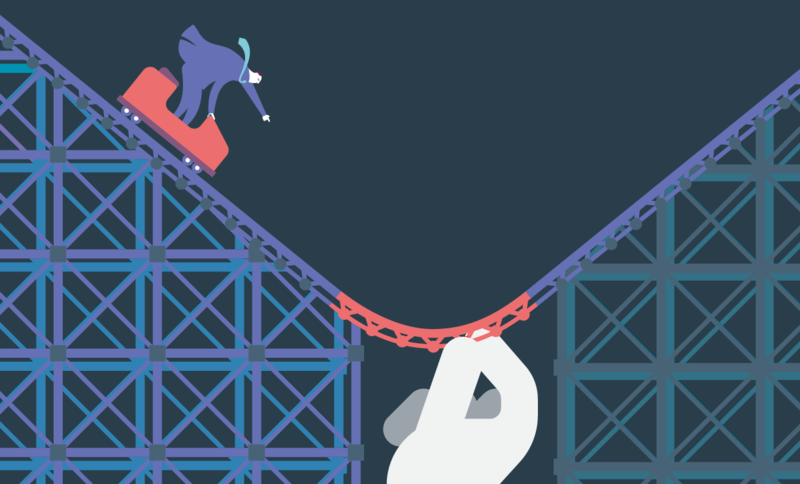 If the shorters at the margin are willing to accept lower prices than buyers at the margin, the contract will trade at a discount. At that point, market makers will be net buyers, and then sell or short-sell Bitcoin on the spot markets. If the open interest is sufficient large, then this backwardation can negatively affect the price. 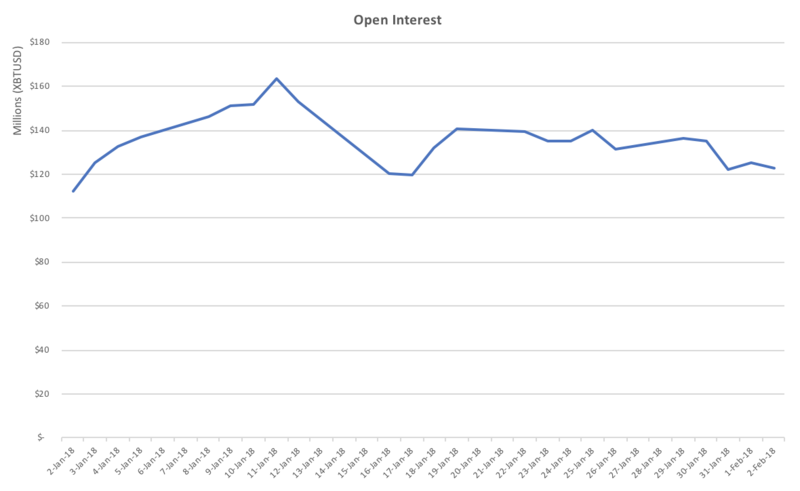 The above is a graph of the open interest in XBTUSD since January 2018. It is relatively small. The maximum open interest over the period is $164 million. Assume that all market makers are net long, which means they must short-sell Bitcoin spot to remain price neutral. That means that $164 million of Bitcoin must be sold. That is not a per-day flow but a stock of short Bitcoin positions. The spot market on exchange trades exceeds $1 billion per day. The OTC volume is unknown, but it is not insignificant. The short pressure at its logical maximum emanating from the CME and CBOE contract holders is meaningless. Therefore, the effect on the broader market in actual flows is negligible. The contracts mainly bolster traders’ bullish sentiment. In terms of trading volume, BitMEX continues to blow both of these contracts out of the water. In the year to date, the BitMEX XBTUSD, XBTH18, and XBTM18 products traded a combined $53.14 billion versus CME and CBOE combined Bitcoin futures volume of $4.48 billion. BitMEX is 12x more liquid. The evil bankers can’t stand a coterie of misfits becoming millionaires and billionaires, so they crashed the party by aggressively shorting Bitcoin in the spot markets. The large financial institutions do not own Bitcoin in large quantities, if at all. They are hamstrung by KYC/AML concerns surrounding Bitcoin. That means that if they wanted to sell Bitcoin, they would need to borrow it from a credible counterparty. Hey, Cumberland Mining, can we borrow $100 million of Bitcoin? Assuming banks borrowed Bitcoin with the intention of shorting it, they would need to sell it on an exchange. Given the skittishness that inhibits counterparties globally from placing large amounts of capital on an exchange, I highly doubt any compliance department at a bulge-bracket bank would approve opening an account. Let’s suspend reality and assume they allowed trading desks to open accounts on the largest Bitcoin spot exchanges. The maximum the desk could make is 100% if Bitcoin went to zero. But, if the market instead face-ripped them by 50% on a $100-million position, that loss would reach the global head of trading and of the investment bank. If you were the line executive that green-lit that trade, you would lose your job. You shorted Bitcoin, and lost a huge sum of money. That would make it into the financial press; you and your bank would be ridiculed. The career and operational risk of trading Bitcoin and then shorting it would dissuade any bank from acting. After the Chinese passed the crypto trading baton to South Korea, all policy actions emanating from South Korean territory were closely watched. When a South Korean Department of Justice official proclaimed that they would attempt to ban crypto trading in Korea, the market crashed. However, unlike China, there is legal due process in South Korea. Also unlike China, South Korea’s economy is open. When the dust settled, the legislators clarified that they merely wished to have more visibility into who was trading what. Korean punters must now use real-name accounts; minors and foreigners are prohibited from trading. This is hardly draconian or a ban on trading. The South Korean government is captured by crypto. The country’s National Pension Fund even holds equity investments in many of the largest trading venues. Korea’s most successful technology startup, Kakao, owns the largest exchange by trading volume, Upbit. Is the government really going to torpedo an industry that millions of voters love, and an industry that is creating high-paying jobs? No. Your average Kim will keep the faith, and continue to trade crypto. The exchanges were halted from accepting new accounts. That measure will be lifted sometime in February. With more new blood in the market, expect the negative sentiment to wane. I don’t know why markets continue to react to negative policy announcements from China. The regulators instructed all financial institutions to do a self-assessment and ban any payments connected with crypto trading. This was in response to the rampant OTC trading occurring after they shut down public trading of crypto on the large exchanges. While the on-ramp into crypto is more cluttered, Chinese punters will find ways to obtain any financial exposure they wish. If people can find a way to build illegal power plants in China, they can surely figure out how to buy and sell crypto against Beijing’s wishes. Like many religions, the prelate deems us laypeople unworthy of speaking the their language of the gods. As such, the majority of the crypto world, myself included, has no idea how Tether works. The CFTC subpoena relating to Bitfinex and Tether spooked the markets. However, I don’t believe this is a net negative event. If Tether were in serious trouble, FinCEN and the US Treasury would be the agencies inquiring into its inner workings. If they wanted to shut it down, the first action would be a cease-and-desist order. Given that it was the CFTC that issued the subpoena and that Tethers continue to be created, what the agency is after most likely is not fatal to the currency. Even if a cease-and-desist order were issued, that would cause a market spike in the value of most large-cap cryptos instead of a plunge. Traders who wished to receive any real value at all would sell Tether and buy any crypto they could. The price of Bitcoin/Tether would spike, and this would drag the Bitcoin/USD value higher as well. This is similar to what happened when the banking issues on Bitfinex drove people to sell USD IOUs on Bitfinex and purchase Bitcoin, and then withdraw it. Bitfinex led the market higher, and the rest of the exchanges followed. If you believe there is actually trouble in the Tether Hotel California, then go long on Bitcoin. But the market action suggests that the latest legal issues are benign. The prices of the entire crypto complex crumpled. However, on a year-over-year basis, Bitcoin is up multiple hundreds of percent. Maybe your favourite shitcoin isn’t, but that’s just the game. 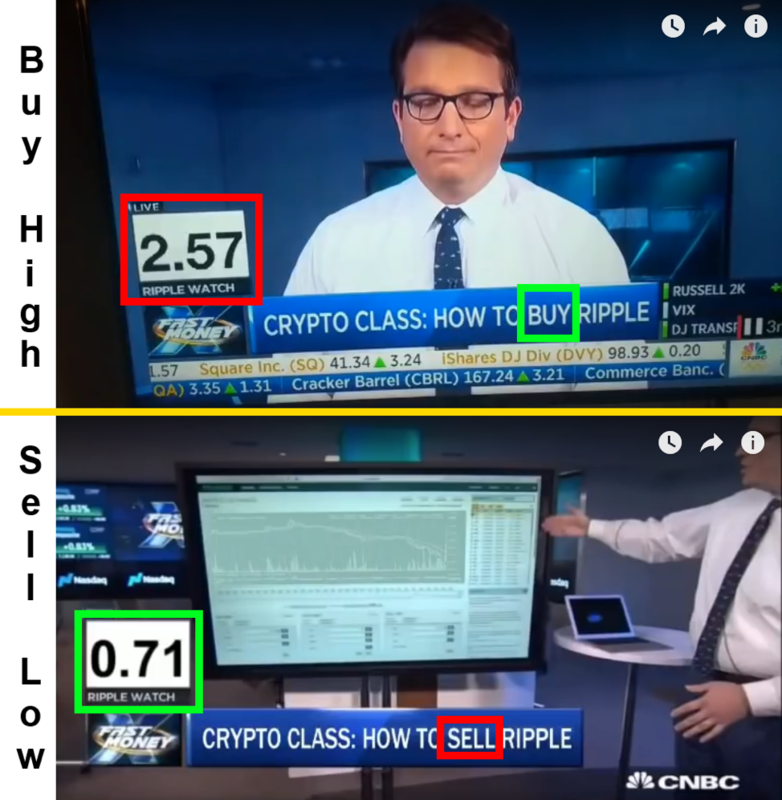 Don’t let CNBC fool you into buying tops and selling bottoms. If the publicity surrounding this asset class diminishes, that could elongate the bear market. However, the financial presstitutes, as Nassim Nicholas Taleb calls them, are hooked on crypto. There is real pathos in this industry. The most-read financial stories will continue to be about this space and people therefore will continue to wonder what all the fuss is about. That will continue to drive new money into the system. For short-term traders, the amount of new fiat entering the system is the most pressing concern. If you believe the correction results in no new blood entering, then as weak hands cash out they will drive prices lower on the margin. However crypto traders are volatility junkies. Once you trade crypto, even when the equity market “crashes” 5%, you merely brush it off your shoulders. For long-term “investors”, nothing has changed about the technological merits of Bitcoin or your favourite shitcoin. Either the coin or token will be useful or it won’t. The market gyrations are irrelevant. The only certainty is that price volatility will rise as the crypto complex is chopped into bits. For us crypto traders, this is going to be an amazing first quarter.